had a great lesson today, Aramis behaved himself which always makes for a great day in itself! afterwards Mr. Pawlish and i had lunch with my friend, then headed to the grocery store for some much needed supplies... and as i'm typing i just remembered that i forgot the guacamole. bums :( i forgot it the week before, too! 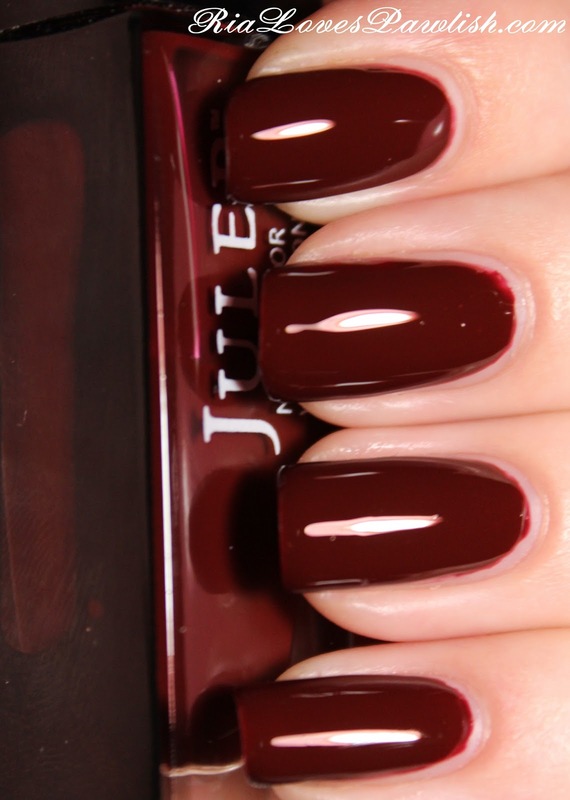 today's polish is Julep Coco from my May 2013 Julep Maven 'It Girl' box! it's an oxblood red crelly (creme/jelly hybrid!). i'm really impressed with the formula, it's opaque in only two coats... some polishes in this finish are difficult to get up to full opacity! it dries quite glossy on its own, i did add topcoat to aid in drying. two coats Coco, one coat Seche Vite. thanks you, that's so sweet!! Very pretty! I went with Boho Glam this month, but I think I'll have to order this one soon! i feel like it's dupe-able, but nothing is springing to mind at the moment!